Whether you are a baby gay or can recite every line of The L Word, you’ve probably heard of the legendary Dinah Shore party. You know, that weekend where lesbians from all over the world flock to Palm Springs to dance, drink, and do other things that you’re not allowed to talk about during polite dinner conversation. 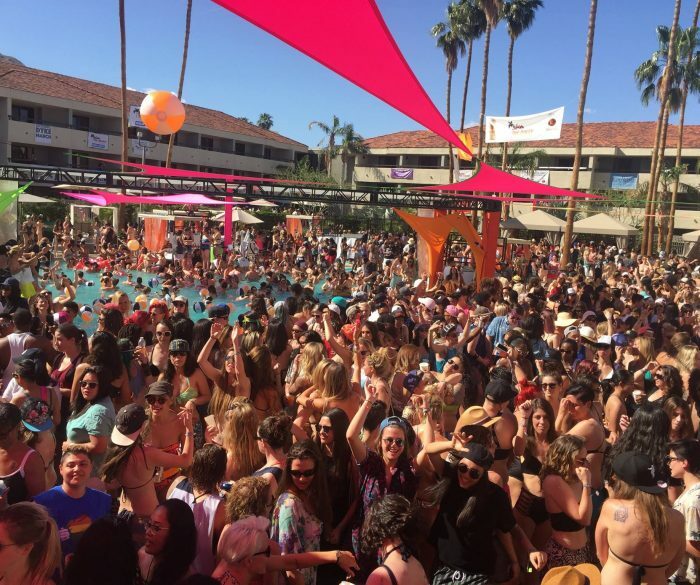 We had the chance to chat with Mariah Hanson: veteran party thrower and the founder of Dinah Shore Weekend who has #blessed us with this party. Flygirl: When do you start planning a Dinah party? Mariah: I am perpetually planning The Dinah! We start planning for the next year at any point in the current year’s production when we realize we can do it better. Flygirl: Wow, it never ends, eh? Mariah: Definitely. A good production is a work in progress as technology changes, trends change, and people change. We want The Dinah to reflect the best in ourselves, society, and of course production and so we constantly tinker with the event to reflect our ideology. Flygirl: What are some of the most challenging aspects of the job? Mariah: Production is always a challenge as it has so many moving parts but must look seamless to the attendee. Traffic controlling all the moving parts is challenging. Picking great talent that resonates with our base is always a challenge as we have women from all backgrounds. We’re committed to the beauty of diversity in all we do, so we offer a wide range of talent with various backgrounds. Flygirl: That’s a big task. How do you choose which celebrities to invite? Flygirl: Have you noticed any change in party-goers over the last few years? Mariah: Dinah-goers are engaged and aware and this makes for a Dinah platform that has a powerful statement on our part, simply because our guests are paying attention. It’s been pretty cool the last few years to make the statements that we have and to actually have them noticed and appreciated. Flygirl: What has been your most memorable Dinah party? Mariah: Katy Perry always. She was an amazing concert. I think Jessie Reyez this year is going to be one of my great memories. She is uber talented and her politics are spot on. Flygirl: What’s the rowdiest thing you’ve ever seen at Dinah? Flygirl: Yes! We still find it odd that the idea of making sure that parties are safe spaces hasn’t caught on yet in the straight partying community. Okay last question: Dinah’s beginnings are rooted in a weekend for lady-loving golf enthusiasts. Where do you see Dinah in terms of audience, scale, and place in popular queer culture in five years? Mariah: I see it then as now—an important event in our LGBTQIA culture that represents a time of celebration and declaration that we live out loud and our collective voice will be heard.